Home » History » Philippines » Pinoy brain » Pinoy Trivia » Slave » What you call "Servant who is housed"? » What you call "slave had their own houses"? What you call "slave had their own houses"? Alipin that had their own houses, which was usually built on the property of their masters. They were also known as tuhay, mamahay, or tumaranpoc (Spanish spelling: tumaranpoque) in Visayan, literally means "house dweller" or "villager." 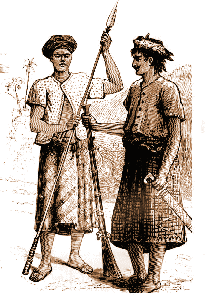 They were not at all slaves, as they were often only obligated to pay a percentage of their earnings or harvests (known as handog in Tagalog and buhis in Visayan, 'tribute' and 'tax' respectively) to their masters and no more, thus making them more similar to the medieval European serfs and commoners. They may sometimes be called upon by their masters for harvesting, sowing fields, building new structures, or for aid in emergencies, though these were usually not part of their obligations. They could also freely buy their way out of debt and could marry without the consent of their masters. In the Visayas, some tuhay might also serve their masters in war, like the horohan.